The basilica in Echternach and how it developed over time. Three pictures: The photo on the left shows a drawing of the basilica in the 16th century. The photo in the middle shows the basilica like it looks today. The one on the right is an old postcard showing the basilica as it looked from its reconstruction in 1863 until its destruction in 1944. The Romanesque Basilica stands on the site of a small Merovingian church and a Carolingian church, the crypt of which has survived. Saint Willibrord’s shrine is located in this crypt. He is the only Christian saint buried in Luxemburg. Born and educated in Northumbria (Ripon, England), he moved to Ireland to continue his education. 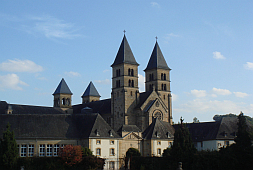 As a missionary he converted the Frisian kingdom to the Christian faith and founded an abbey in Echternach. The construction of Willibrord's abbey church began about 700 A.D. He was buried in this church after his death in 739. Due to the influx of numerous pilgrims, this church was judged to be much to be much too small. It was replaced by a Carolingian church, which burned down in 1016.